I use an external monitor with my laptop, and if you do too, there’s a keyboard shortcut you should learn—Command-F1. This nifty little combo will turn display mirroring off and on, so if you need to temporarily see your Dock or your open windows on both displays, it’ll let you do that. This is just a quick way to, well, mirror the functionality of System Preferences > Displays > Arrangement > Mirror Displays. To put things back the way you had ’em, press Command-F1 again. Oh, and if this doesn’t seem to be working for you, check out your options at System Preferences > Keyboard, under the “Keyboard” tab. There’s a checkbox there for “Use all F1, F2, etc. keys as standard function keys,” and if that’s on, the keyboard shortcut will be Function-Command-F1 instead. Or if you have no idea why that setting is on, you could turn it off as I’ve done above to enable Command-F1 to work. Whatever blows your virtual skirt up! You should also mention the wonderful little app called Display Menu, available in the Mac App Store. This brings display options back to the menubar where they belong! 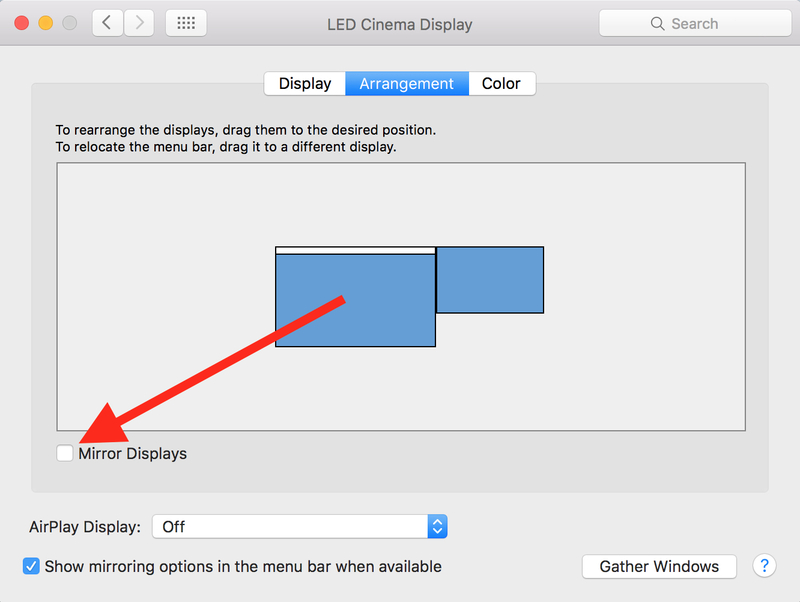 You can quickly enable/disable mirroring and set the resolution of internal or external displays. Definitely worth a look. I use it all the time. Love that F1 command. If memory serves, it works the same on Windows (or did at one time). I use it regularly when presenting slides.